Did you know that the average teen sends and receives over 100 texts a day! Many parents would consider this excessive but they would be more concerned to know that 20% of teen drivers admitted to having long conversations through text message while operating a motor vehicle. Let’s remember that that percentage is of teens who admitted that they texted while driving. The actual percentage of teens that text while driving is likely much, much higher. What we know is scary, what we don’t know is even scarier! Recently, the AAA’s Foundation for Traffic Safety released a study that trumped the NHTSA’s estimates regarding teens and distracted driving crashes. 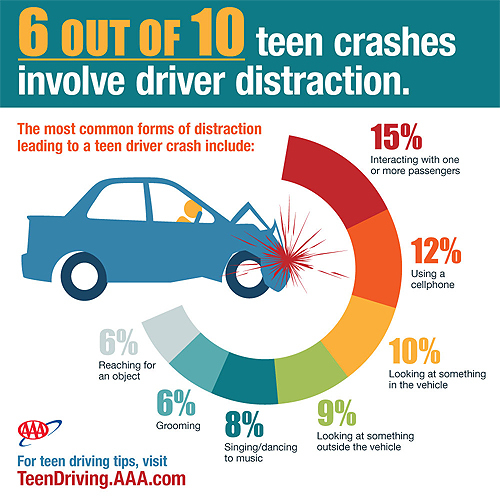 The NHTSA has been estimating that 14% of teen crashes were caused by distraction whereas the FTS reported that 58% of teen crashes could be attributed to distraction! It’s important to note that a distraction is not solely related to cell phone use. In fact, according to the FTS study, the distraction of interacting with another passenger was more prevalent in causing a crash than cell phone use. What to do, What to do?! As the number one killer of teens in the United States, car crashes, while now known to be largely caused by distractions for teens, can be reduced with technology. More importantly, educating parents and teens AND changing habits will give preventative technologies the power it needs to change the tide. Typically, a closed driving course is one in which an area is completely closed off and sculpted, usually with cones, to create a driving course. Most closed driving courses consist of various sharp turns and other obstacles that give inexperienced drivers the chance to maneuver through things they might experience on the road. Anyone looking to get a license must complete and pass some form of a driving test but some cities are taking things in a different direction. Imagine being required to text and drive during your driving course. That’s exactly what’s happening in New York, San Antonio, and many other cities nationwide. Drivers are encouraged to text message as they try and complete the course. This helps give teens a better understanding on the dangers of distracted driving. Moreover, there is a deeper proliferation of the message regarding teens and distracted driving dangers since many are more aware and more likely to spread the message. In addition to this, there are also online simulation driving courses too. Companies like Virtual HD and eDriving offer users a wide selection of courses for individuals wanting to sharpen their driving skills. Users can practice using different distracting simulations like having passengers in the car, cell phone use, and more. The bottom line is to assure that both parents and teens are educated on the dangers of distracted driving. It’s important for parents to be good examples. While texting and driving is largely associated with teens, many parents and adults in general do it as well. No one, not even an “experienced” driver can safely drive while distracted. While technology is a root cause in distracted driving, it can also play a big part in the solution. One such solution which many parents may find appealing is the Drive ID manufactured by Cellcontrol. Drive ID gives parents the ability to lock their teen’s mobile phone when they’re behind the wheel. A device is purchased, fastened to the windshield, and registered on the manufacture’s website. Their app is then downloaded to the phones which will be targeted (the teen’s phone) blocking calls, text, and internet use while the car is in motion. For many parents, a device like this might be an option to explore because it is supposedly more tamper proof than other free app options out there. A teen will likely find it difficult to disable the device and the app. If they do, the administrator (parent) will be notified. Additionally, Drive ID provides driving reports allowing parents to see how the teen has been driving looking at things like hard stops and speed. Parents, Teens, and drivers of all types can take advantage of apps to help them build their will power in fighting the urge to use the phone while driving. There are many free and paid apps out there that do not require any additional equipment purchases. You can find a popular list here. Many of the paid apps have similar features that allow parents to enable password protected locking mechanism that will keep a teen from disabling the app. Additionally, some, like DriveSafe.ly provide the functionality for text messages to be read out loud to the driver. It’s important to note that, similar to how passengers can be a distraction to a driver, a text-to-voice message will likely be a distraction that inhibits a person’s cognitive abilities when driving. So while this may seem like a favorable feature, it is not totally safe since hands-free cell phone use has been reported to be no more safe than hands-held cell phone use. Keeping your teens from using their mobile devices while they drive should not be solely dependent on technology. Why? The underlying root of distracted driving isn’t addressed by technological solutions. We must change our habits such that driving distracted is treated with the same disdain as drunk driving. Distractions don’t come solely in the form of technology (adjusting the mirrors, checking the glove compartment, etc.). Remind your teens that any action that takes their hands off the wheel and their eyes off the road is a distraction. State laws will likely do little to to curb a teens impulse to check their phone when driving. While many states make it illegal for a teen or any person with a restricted license to use a use a cell phone, no state has any ban on hands-free use which is just as much of a cognitive distraction as hand-held use. Parents should insist, if not require, that their teens place their phone in the trunk of the car (or another compartment) when they are operating a motor vehicle. In fact, this is a habit that parents should adopt as well. Parents should enforce the rules of no cell phone use while driving and carry out punishments when the rule is broken like taking away their cell phone for a week. This is where a device or app that can provide you metrics on your teens driving is important as a teen is not likely to confess on their own that they used their cell phone on a trip made without you. Above all, sit with your teens and talk to them about the dangers of any distraction while driving. Most importantly, practice what you preach!